Do we trust the people we hand our keys over to to do a really good, thorough job, within our budget? It’s a big question. The staff here are fully committed to the business, not just passing through, so you’re highly likely to find them here next time. Big or small, new or old, modern or classic we’ll be delighted to attend to your vehicle whatever it is. Many of us have worked happily together before. We all love vehicles and we stand or fall by our customers being happy and returning. If we don’t please them there is no giant manufacturer pouring new vehicles at us to paper over shoddy customer service. Knowing this, how much do you think we will value your custom? All servicing is carried out to manufacturers specifications at a fraction of main dealer cost. And don’t worry about invalidating your vehicles’ warranties. In October 2003, E.U. 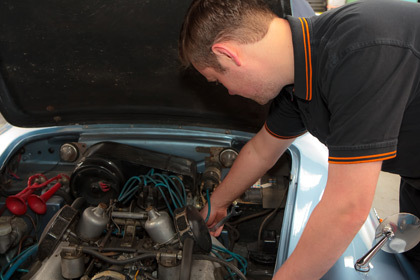 legislation affecting the motor trade came into force. It means independent garages can now carry out maintenance on your cars without invalidating your vehicle assembler’s warranty. To find out more please contact us. Because we have such a hugely diverse ‘pool’ of technical knowledge and real-world experience, our Technicians are very quickly up to speed on the trials and tribulations of each and every car that comes through the door. They are real car people who in only the last year have worked their magic on: Jaguars, Fiats, Morgans, Vauxhalls, Audis, Bentleys, Fords, Range Rovers, Skodas, Volvos, Peugeots, Renaults, Toyotas, Mazdas, Rovers, Land Rovers, Volkswagens, Ferraris, Daimlers, Mercedes Benz, Porsches, Citroens, Hondas, Kias, Hyundais, Alfa Romeos, Lexus, Vauxhalls, Jeeps, Chryslers, Subarus, Minis, Saabs, Maseratis Lotus and BMW cars plus a large number of light to medium sized car-derived vans and light commercial vehicles. The wise old saying “Experience has no price” has always applied to cars and this vast, collective mass of motor vehicle knowledge should be a great comfort to anyone whose car needs work because it means we have greater depths of expertise on which to draw. This is reflected in the utterly diverse range of faults and ailments that we have cured in the last 12 months, a few of which are featured in the section entitled Real Life Stories and which we guarantee will prove surprisingly illuminating – please take a look.